One of the most important aspects of construction is safety. Following deadlines and doing clean work are big responsibilities for contractors, but these things come secondary to keeping employees out of harm's way. In order to reduce the frequency of on the job accidents, construction crews take courses on various on subjects. Too often, poorly assembled scaffolding leads to an accident. For this reason, scaffolding training is often recommended for crews. In these classes, they are instructed on the proper way to construct a platform, awareness, and proper procedure. These classes aim to lower accidents rates by teaching workers about how scaffolding accidents happen. 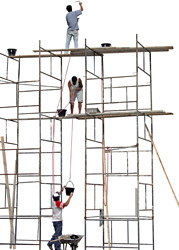 OSHA reported that nearly ninety deaths occur per year as the result of scaffolding accidents on the job. Even more serious injuries occur as the result of poor installation, careless behavior, and falling objects. Workers can spend most of their day working with dangerous equipment several dozen feet above ground. Any fall from that height can be quite injurious, but construction workers may fall while onto tools or heavy machinery. Working on scaffolding is precarious to say the least. Scaffolding training seeks to reduce on the job accidents by teaching construction workers proper safety and assembly procedures. Many injuries are the result of carelessness. Course on scaffolding highlight the dangers of common assemblies. Most classes are designed to bestow the title of "competent person" upon a selected scaffold supervisor. Most businesses and safety organizations require on of these people on every crew that may need to oversee the use of a platform system. These people oversee the construction of scaffolding and make sure their subordinates follow proper procedure at all times. They are also in charge of completing regular safety inspections on the structure. Scaffolding systems used in construction look deceptively simple. They seem to be a simple pipe and wood platform. However, the proper erection of a scaffold requires knowledge of framing, tubing, and couplers. Systems also need to be properly dismantled in order to ensure future use of the platform and promote safety. Some scaffolding courses also address powered access systems. These raise and lower employees to different areas on the site. For obvious reasons, proper maintenance and installation of this equipment is key. Also, OSHA, the government agency that regulates safety in the workplace, applies a number of official regulations on scaffolding. Many courses are approved by this organization as a good source of information about federal regulations on these structures. Providing proper scaffolding training to employees in the easiest way to keep a jobsite up to OSHA standards. Scaffolding is a very necessary tool for construction crews. Although it is the best way to reach inconvenient places, it can also prove dangerous. Scaffolding courses urge employees to stay focused while working in order to reduce accidents. A reliable and trained supervisor and a trained crew are more likely to be safe around these structures. Information on the proper use of scaffolding promotes safety and saves lives.